"Come check out the best handmade artists in the Metroplex and buy something completely unique for Valentines Day. Free admission, located inside the Historic Hilton Hotel Ft Worth, TX. Handmade jewelry, wood work, ceramics, paintings, men's accessories and much more!" Tables, chairs and electricity provided. Artist must bring own extension cords. Applications are available here and are due by February 6th, 2014. For more information, visit their website or contact their event coordinator at info@dallashandmade.com / 214-396-8585. "The “Share the Harvest” Fall Gift Market at Jacob's Reward Farm showcases over twenty local artisans, offering their hand made goods for outstanding holiday gift shopping, right here on the farm grounds. Stroll among the tent-covered booths and enjoy music, food, art, professional storytelling, photos with farm animals, and gorgeous October weather. Always the third Saturday of October, 10 AM to 4 PM. Free admission and parking. Fun for adults and kids!" Booths are 8 X 10 and cost $35. Wifi available, no electricity, bring own chairs, tables, display items. Applications are available here and are due by August 31st, 2014. For more information, visit their website or contact their event coordinator at ctelisak@gmail.com / 214-284-9218. Booths are 10 X 10 and cost $50. Booths are inside and out. Outside booths are reserved for vendors whose merchandise is tailored to an outside environment. These fees include chairs and electricity for inside booths. Rectangular tables can be rented for $15 (each). Electricity and tents for all outside booths are not included and must be provided by each vendor. Applications are available here and are due by March 3rd, 2014. For more information, visit their website or contact their event coordinator at SpringFair@anshaitorah.org. Additional contact Harvey Swento at Harvey.Swento@anshaitorah.org / 972.473.7718. "The Steampunk Ballroom will be at the "Fashion and Flea at the Grapevine Convention Center." On Saturday February 1st from 1 to 4 meet Danielle Colby Cushman, of American Pickers! You will only find items that are vintage, antique, locally produced or hand-crafted. They are local, sustainable and green." "The City of Princeton is gearing up for our annul July 4th Spectacular. This year the event will be held on Wednesday July 3rd from 5-10 pm at our Community Park / POW Camp. With over 7,000 in attendance last year we are planning for even more spectators this year. Parking will be $5.00 a car and you can purchase a parking pass in advance at City Hall, 123 W. Princeton Dr., Princeton Texas 75407. Our event will be fun for the whole family. There will be a Softball game against the reigning Champions the Princeton Police Department and the Princeton Fire Department, bounce houses, arts & crafts, various vendors, food and drinks for purchase. Carter Blood Care will also be there for blood donations. Again this year, we will have local bands playing. We will end the night with a spectacular fireworks show that will start around 9:30. So don’t miss out, come and join us for the fun, festivities and entertainment! SEE YOU THERE!" Parking is $5 per car. Booths are 20 X 20 and cost $60. Trailers must get 2 spaces. Applications are available here and are due by June 23rd, 2014. For more information, visit their website or contact their event coordinator at sbowman@princetontx.us. "Shopping for a Cause! Numerous businesses, consultants, vendors selling their products and services. Carter Blood Care Coach will be on site for a blood drive. There will be concessions, bounce house for the kids, free samples and much more! All proceeds from this event will benefit the Culverhouse family of Princeton, Texas. The Culverhouse's six year old son Jack, who attends first-grade at Lacy Elementary, was recently diagnosed with an inoperable brain tumor. Radiation and chemotherapy treatments have begun and Jack is fighting strong. The proceeds will help this family with household and medical bills." Booth sizes are negotiable and the fee is $45. The main shopping area is inside the cafeteria. Cafeteria tables (8X6) are available for use. Electrical is available upon request. Applications are available here and are due by February 15th, 2014. For more information, visit their website or contact their event coordinator, Michelle, at mich2899@Yahoo.com / (214)585-1143. "'White Diamonds Expo' is back. You don't want to miss this exciting, free event where you can shop with up to 30 vendors (depending on location) for that perfect gift for a birthday, wedding, new baby, or any special occasion (maybe even just for you). Hand bags, jewelry, cosmetics, accessories, scrapbooking, clothing and much more. Our vendors specialize in personal attention and will make sure that you make the perfect purchase. You will always find something you must have at our White Diamonds Events! The first 100 shoppers will receive a FREE diamond bag. Prizes will be given away every hour. All Teachers and District Employees will receive 5 entries into our hourly drawings." Print your free admission tickets here. Booths are 8 X 10 and cost $60. This fee includes Free WIFI and electricity. Applications are available here and are due by February 1st, 2014. For more information, visit their website or contact their event coordinator at success6m@gmail.com. "Did you know? It is estimated that 70% of women and men will come into contact with HPV during their lifetime. What are you waiting for?? Join the movement!♥ Join the NCCC Texas (Fort Worth) Chapter for their 2nd Annual Dance to beat Cervical Cancer! Zumbathon to celebrate Cervical Cancer Awareness month. Bring your friends and get a great workout while benefiting a good cause! We will also have raffle prizes! This will be a fun and dynamic workout led by Lorena and guest instructors. This event will be taking place at the UTArlington Maverick Activities Center." Admission is $15.00 on Eventbrite or through ticket sellers. $20 at the door. 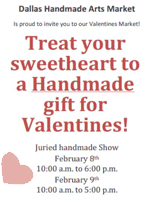 "Join us for two fun fill days at the RHS Eaglettes Valentine’s Craft and Gift Fair with more then 70 + vendors to shop from. There will handmade jewelry, scarves, picture frames , embroidered items, gifts, candles, skincare products, recycled wood, books, cork crafts-wreaths, trivets, coasters, cosmetics, hair bows, tea, gourmet nuts and salts, children apparel, pet adoption, themed gift boxes, gourmet dry mixes, dessert salsas, chips, Christmas décor items, pralines, tamales and much more!!! The Eaglettes Valentine’s Craft and Gift Fair will be here in time for that special Valentine’s gift or for any gift throughout the year. " "We have over 30 vendors with a wide variety of products/merchandise that fit everyone wants and or needs! The Red Oak Market is every 2nd and 4th weekend (excluding May and December) in 2014! Please come out and enjoy some stress free shopping while supporting local and small businesses!! " "One day event held the 3rd Saturday of the month. Next show is February 15, 2014 from 930 - 4. Venue is over 15,000 sq ft inside with capability of holding 75 - 10x10 booth vendors or outside on patio holding 25 - 10 x 10 vendors. Show is well advertised, newspaper and radio as well as local business and flyers." Applications are available here and are due by February 10th, 2014. "Indoor/Outdoor Craft Show with a wide variety of booths." Each booth/vendor will receive one free lunch coupon. Applications are available here and are due by March 13th, 2014 (or until sold out). For more information, contact their event coordinator at parentsoffaithschool@yahoo.com / PFS Craft Show, P.O. Box 479, Stephenville, TX 76401. Applications are available here and are due by February 7th, 2014. "This is a yearly summer big festival that is all about artisans of all handmade goods! Join us!" There is no fee of admission, but please bring a can of food for the local food drive. Booths are 10 X 10 outside and cost $50. Vendors provide their own tents, displays, tables, chairs, etc. Applications are available here and are due by May 31st, 2014. For more information, visit their website or contact their event coordinator at thesasszilla@gmail.com. "8th annual craft show benefitting Guyer High School choir. Saturday, November 8, 2014 from 9:00 am - 4:00 pm. Held at Guyer High School, 7501 Teasley Lane, Denton, Texas. Free parking. Free admission. Over 1,000 patrons. Local choir performances during the day. Door prizes. More than 140 vendors including jewelry, quilts, soaps, candles, etc. " Applications are available here and are due by November 6th, 2014. For more information, visit their website or contact their event coordinator, Pam, at guyerchoircraftshow@gmail.com / 972.880.0501. "Free fun for the whole family! This year's Gift & Craft Show will host a number of amazing vendors with unique items for everyone, as well as live entertainment and door prizes given away all day. This fun event will also include great silent auction baskets, entertainment, and free Kiddie Korner crafts for the kiddos. Admission is free." Each booth will be provided with 2 chairs and an identifying booth number. A free continental breakfast will be available until 9:00 am for our vendors as well as a bottomless tea glass all day. They will also have help for loading and unloading for our vendors. Applications are available here and are due by April 1st, 2014. For more information, visit their website or contact their event coordinator at craftshow@lightningdancers.com / 817-602-7841.